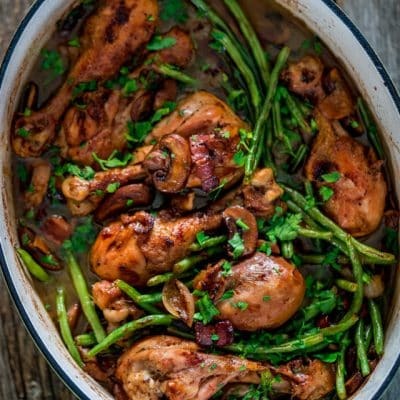 This Coq Au Vin with Mashed Potatoes is a popular French dish is made with chicken braised in red wine with mushrooms, onions and green beans, lots of herbs, perfect for fall! Preheat the oven to 450 F degrees. In a large Dutch oven fry the chopped bacon until crispy. Remove the bacon from the pot but leave the fat there, if you have more than 1 or 2 tbsp of bacon fat, discard the rest. Season the chicken drumsticks generously with salt and pepper and add to the pot. Cook the drumsticks on both sides over medium-high heat, until they start to brown, about 3 to 5 minutes per side. The chicken doesn't have to be cooked through as we will braise it later on and will continue to cook. Remove the chicken from the pan and set aside together with the bacon. Add the cipollini onions and the mushrooms to the pan and cook for 3 to 5 minutes until the onions start to caramelize and the mushrooms start to brown. Stir in the garlic and cook for 30 seconds until the garlic starts to get aromatic. Deglaze the pan by stirring in the red wine, scraping all the brown bits as you go along. Stir in the chicken broth, then add the bay leaves, thyme, rosemary and sage leaves. Add the bacon and chicken back to the pot. Bring to a boil, reduce the heat to a medium, cover the pot and cook for 20 minutes. Add the green beans to the pot. Whisk the melted butter with the flour and stir it into the pot. Taste for seasoning and adjust with salt and pepper as needed. Place the pot without the lid into the oven and cook for another 10 minutes until the sauce thickens. Remove the bay leaves, thyme, rosemary sprigs and sage. While the chicken is braising in the wine you can make the mashed potatoes. Boil the potatoes in water with a bit of salt until fork tender, should take about 15 minutes, but depends on size of potato cubes. Drain the water from the potatoes and add them to a large bowl. Add the butter to the hot potatoes, and the butter should start to melt right away. Add the heavy cream, salt and pepper. Using a potato masher or electric beater, slowly mash the potatoes until smooth and creamy. Serve the Coq au Vin over the mashed potatoes. *Any part of the chicken can be used here, even chicken breast, but to get the ultimate flavor, I recommend leaving the skin on and bone in. **Cipollini onions literally mean "little onions" in Italian and are great for caramelizing and roasting.